Longnose gar are large, cylindrical fish with a long beak-like nose and rounded tail. Their hard, diamond-shaped (rhombic) scales create a very effective armor against most predators. The coloration of longnose gar varies. Typically, the upper side is gray to olive while the lower side is white or silvery. 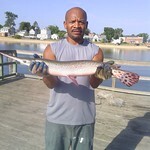 Gar spawn in shallow water, May-June. Although few people eat gar meat, traditional fishing methods for capturing these tough fish is by sight-fishing with a bow or spear. Other methods include suspending bait just below the surface of the water in shallow areas or using frayed nylon cord as a lure. Gar can survive in water with very little oxygen. Their specialized swim bladder allows them to utilize air that they gulp at the surface of water to supplement oxygen that is taken in through the gills. The skin of gar is very tough. Reportedly, early settlers and native Americans used their hide as abrasives and shield covers. The scientific name for gar (Lepisosteus osseus) translates into "boney scale." For information concerning longnose gar and their management, please contact Mary Groves.